A towering layer cake or a platter full of frosting-topped cupcakes are classic birthday dessert options, but as much as I enjoy those, I admit that I don’t always opt for traditional cakes when it comes to celebrating birthdays. There are some dessert-lovers who prefer something smaller, something less sweet or simply something different and these Birthday Cake Madeleines are a less-than-traditional option that anyone celebrating a birthday would love to receive. Madeleines are sometimes described as cookies, but they’re really little tea cakes that are made with a sponge cake batter. They’re baked in shell-shaped molds and end up with a crisp, golden outer edge that not only tastes delicious, but contrasts well with the fluffy center of the cakes. These tea cakes are surprisingly easy to make. They start by whipping together eggs and sugar, then folding in the rest of the dry ingredients. Butter is added last, tenderizing the batter after it has some structure. This mixing technique produces cakes that are sturdy, yet tender. You will need a madeleine pan for best results. Since the batter can be baked in batches, just one pan is enough to bake a whole bunch of madeleines. 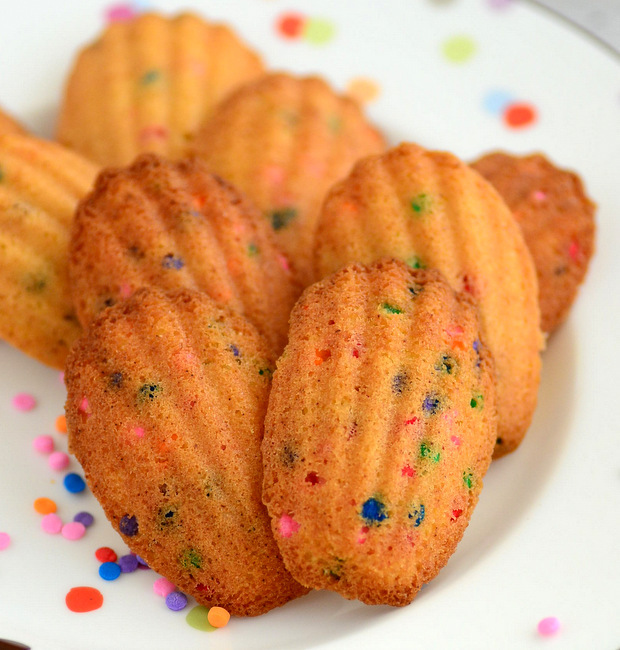 To capture the flavor of birthday cake, I used a combination of vanilla and almond extracts in the madeleine batter – the same combination of extracts that I use when making white cake, which is my favorite kind for a birthday party. I also stirred in some rainbow sprinkles for a colorful funfetti look. The sprinkles add color, not flavor, and are a very easy way to make a cake (or cookie) a lot more festive. If you really feel like it’s just not birthday cake without some frosting, you can serve these with a little bowl of vanilla buttercream. The madeleines aren’t overly sweet, so a little bit of frosting won’t overpower them. Stirring a few teaspoons of rainbow sprinkles into the frosting will give it a pop of color and really tie it in with the colorful madeleines. Preheat oven to 375F. Lightly grease and flour your madeleine pans (unless you are using nonstick, in which case light greasing is all that is necessary). In a large bowl, beat together eggs and sugar until smooth and thick, 1-2 minutes. Add in vanilla, almond extract and salt. Sift flour and baking powder into the bowl and mix until it is just combined, and no streaks of flour remain visible. Slowly add in the melted butter, streaming it in while you stir constantly (or mix at a low speed) and it has been completely incorporated. Place a generous 1 tbsp batter into each cavity of your prepared pan. Bake for 11-13 minutes, until cookies are golden around the edges. Allow to cool for 3-5 minutes before removing from the pan. The pan should be cooled, regreased and floured before filling it with more batter (it is ok if the batter must be used in batches) for another batch. I love Madeleines! These look so colorful and perfect for birthdays! These look amazing! Will definitely try this!